Choosing the most suitable intervention strategy to help children with Autism Spectrum Disorders (ASDs) cope is difficult because there are a large number of theories, including TEACCH, Floor-time and ABA, and each child with autism presents differently. In this book, the authors argue that theory must be combined with data in order for it to be used effectively in developmental intervention. 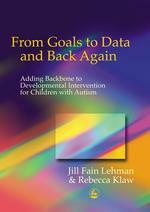 Aimed at professionals, as well as parents who want to be more involved in their child's development, the authors explain how to write basic developmental goals, how to collect data and analyze it and how to use the results of analysis to inform the next round of intervention decisions. A CD ROM provides a shortcut to setting up forms and guidance in their completion.